The newly renovated Crowne Plaza Hotel Monroe-Jamesburg is conveniently located in Central New Jersey at exit 8A of the NJ Turnpike near South Brunswick, Dayton & Cranbury. Hotel is 1 hour from NY City, Philadelphia & Atlantic City & less than 30 minutes from Newark Liberty Airport. Closest Crowne Plaza to Six Flags Great Adventure. Nearby to the Raceway Park in Englishtown, Jackson Factory Outlets, Crate & Barrel Outlet, Canon, Rhodia, Hyundai, LG Electronics, Robert Wood Johnson Medical Center, Audi/Volkswagen, Lenox Warehouse & Outlet Store, NCS Pearson, The Meadowlands Sports Complex & Historic Princeton. Complimentary shuttle service to local companies within 5 miles. Our comfortably appointed guest rooms are highlighted by the "Crowne Sleep Advantage " everything you need for a great night's sleep We offer quiet floors, guaranteed wake-up calls & a sleep CD for ultimate relaxation. Complimentary high-speed wireless Internet access throughout hotel. With 10 meeting rooms, over 14,000 sq. 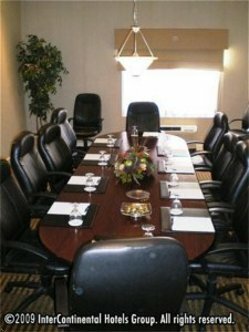 ft. of meeting space & a 5500 sq. ft. ballroom the Crowne Plaza Monroe can accommodate groups from 2-650. "Yogi's All-American Grill & Sports bar" offers casual American dining and favorite spirited drinks daily. Room service is available from 6:30 AM to 10:00 PM. We offer an indoor pool and fitness center. AAA Diamonds: 3. This hotel is committed to providing accessible facilities under the American Disabilities Act. If your accessibility needs are not met, please contact the Hotel Manager on Duty. Should you require additional information regarding accessible facilities for guests with disabilities, please call 1-800-Holiday (U.S. and Canada) or contact the hotel directly. For the hearing impaired, TDD service is available at 1-800-238-5544 within the U.S. and Canada.